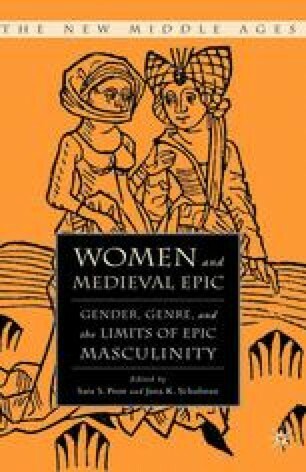 This chapter focuses on women characters in the two longest extant Castilian epic poems. The Poema de Mio Cid (PMC) narrates the exploits of the mature Rodrigo Diaz de Vivar from the moment of his exile from Castile up to the successful second marriages of his daughters and his death. Mocedades de Rodrigo (MR), in contrast, is a later and shorter text which describes some of the youthful exploits of Rodrigo Diaz. The principal argument advanced here is that the relationships of female characters to sociopolitical hierarchies and codes in these texts are more complex than has hitherto been acknowledged. Women in these two epics are without exception excluded from official positions of political authority, but this is not to say that they do not exercise power in unconventional ways, often on the margins of the exchange systems upon which social and political life is based.